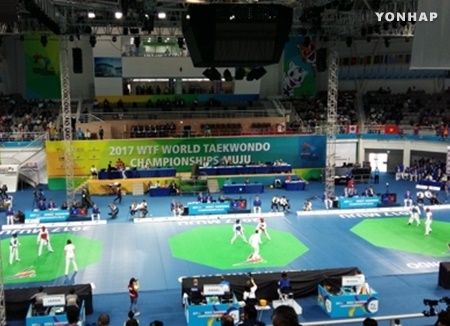 The 2017 World Taekwondo Championships kicked off its seven-day run in Muju, North Jeolla Province on Saturday, with record participation from over 180 nations. The tournament held at the Taekwondowon Center in Muju County will continue through next Friday with matches lined up for eight weight categories for both men and women. The World Taekwondo Federation(WTF) hosts this event every other year, which boasts the longest history as a global taekwondo competition. The federation said 971 athletes and 796 officials registered to take part this year. 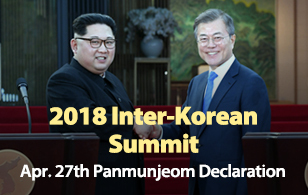 In the opening ceremony later Saturday, a demonstration team from the North Korea-led International Taekwondo Federation(ITF) will hold a historic joint performance with a team from the South Korea-led World Taekwondo Federation. A group of 32 North Korean delegates and athletes arrived in South Korea on Friday, including ITF president Ri Yong-son and Chang Ung, former ITF chief and the only North Korean member of the International Olympic Committee(IOC). The ITF team is the first to visit South Korea in ten years and is also the first to attend an event hosted by the WTF. IOC president Thomas Bach will also visit South Korea next Thursday to attend the championships' closing ceremony the following day.